This really is a super moist bbq salmon recipe. There are of course many ways to cook salmon, but this one really keeps the fish moist. Most salmon steak recipes are interchangeable with salmon fillets. Use the cut you prefer. Preheat barbecue or indoor grill to 500ºF. Set up one large square of heavy duty tin foil for each steak. Place 1/4 of sliced green peppers and 1/4 of sliced onion on each tin foil square to form a bed for the salmon. Place a salmon steak on top. Divide the mayonaise equally and dab it on top of the salmon, speading with a spoon to evenly coat. Sprinkle some brown sugar on each piece. Turn up the corners and seal each packet. Place on hot BBQ for 7 minutes, turning gently with a burger flipper for the last minute. Serve with rice or potatoes. Serves 4, but can easily be multiplied to serve as many as you wish. You can also cook a whole salmon this way. Spread part of the mayonnaise mixture in the cavity of the fish and leave a little to spread over the top. This barbecue salmon is a perfect summer treat and great for entertaining and get-togethers, or for an every day dinner. If you are serving a crowd, a fish recipe like this is a nice change from heavier meats. You might even want to think about serving two protein foods – a meat, like barbecue ribs, steak or chicken, and this salmon recipe. It gives people the option of a non-meat or lighter meal if they want. Salmon of course is extremely healthy for us. 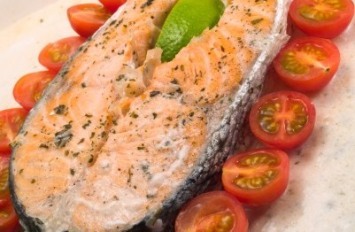 In our Fish and Seafood Recipes section you will find a variety of salmon recipes to suit your tastebuds.